What is truth? That is a big question, and one of primary importance for mankind. There is much debate among thinkers and non-thinkers about the very existence of absolute truth. The non-thinkers are those who would say, “there is no absolute truth” since they would see the logical corner they have placed themselves in. For that statement to be true, it would need to be absolutely true and would thus be claiming its own nonexistence. Even the Roman governor of the province of Judea, in his unregenerate mind, asked the question of Jesus. Earlier in Jesus’ ministry, He made a statement that answers that question. So the first, and primary, thing we must understand is that the truth is a person — Jesus Christ. The ramifications of that are tremendous! In making that statement affirming His identity as “the Truth” Jesus was also saying a lot about what the truth is NOT. 1. The truth is not a set of teachings. Before you react, let me explain. Jesus and the Apostles taught many things, all of which are true. They are factually without error. But they are true because they come from He who is “the truth”. The correct teachings of the Bible are there to tell us ABOUT the truth, and as far as each of them goes, the provide illumination on a part of the picture of Christ. Don’t mistake what I am saying. False teaching is a big deal, because it draws us away from Jesus, who is the source of truth and paints a false picture for us. One good way of discerning truth, especially if someone is using Bible verses on us, is to ask whether or not the teaching in question magnifies Christ Jesus or magnifies us. On our best day, when we are most attuned to the Spirit and are the most receptive, we still see through a glass darkly. 3. We must follow after things in their proper order. 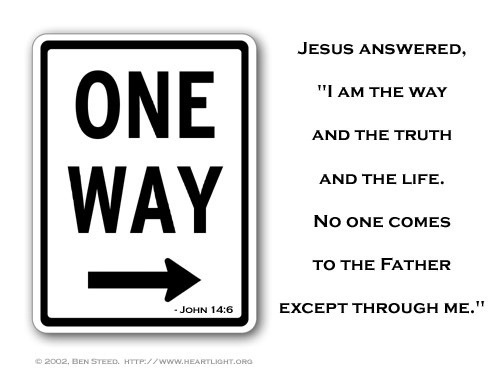 Jesus is the way to truth and life. We find the truth by following Jesus Christ. We don’t sit down and try to once and for all figure out a perfect doctrinal set of teachings and use them to find Christ. No, we follow after Christ and He gives is spiritual food and teaches us line upon line, precept upon precept. 4. Jesus is the full revelation of God, and we need seek nowhere else for truth. God has revealed Himself in Jesus Christ (Hebrews 1:1-2). The Holy Spirit uses the power of the Word to draw us to Christ (John 12:32; Romans 10:17). As long as we are putting first things first, and following after Jesus, the Truth will reveal truth to us through the living and active Word of God (Hebrews 4:12-13). Be patient with yourself. There have been many times I have been frustrated by my lack of discernment or by not being rock solid on exact definitions of everything I believe. But that is okay. As long as I am following after Jesus, and nurturing my relationship with Him through prayer and feasting in the Word, my dark glass will slowly become easier to see through. Remember that we are not following after a philosophy, but after a person — the person of Jesus Christ. Another great post Trail. Thanks!